Alfred Sung introduced Sung in 1988. 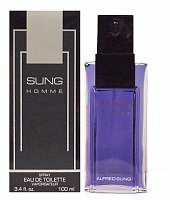 Sung is classified as a sharp, spicy, lavender, amber fragrance. This masculine scent possesses a blend of lemon, tangerine, sage and pepper. Accompanied by cedar and sandalwood. Sung is recommended for daytime wear.